Preheat the oven to 400°F. Line a baking dish with parchment paper. Set aside. Combine the cream cheese, chives, cayenne pepper and salt in a large bowl. Mix until well incorporated. Whip the egg with the water in a separate bowl. Set aside. Add 1 1/2 of the cream cheese mixture to each wonton sheet and add half of a fig. Wet the borders with the egg mixture using your fingertips. Fold each side over the filling to create an X and pinch the borders to seal. Place the wontons on a baking dish sprinkled in cooking spray. Bake for 15 to 20 minutes or until browned and crunchy. The figs can be substituted with any other dried fruit, like apricots. Now that the holidays are well on their way, we have to start preparing for all of our guests. 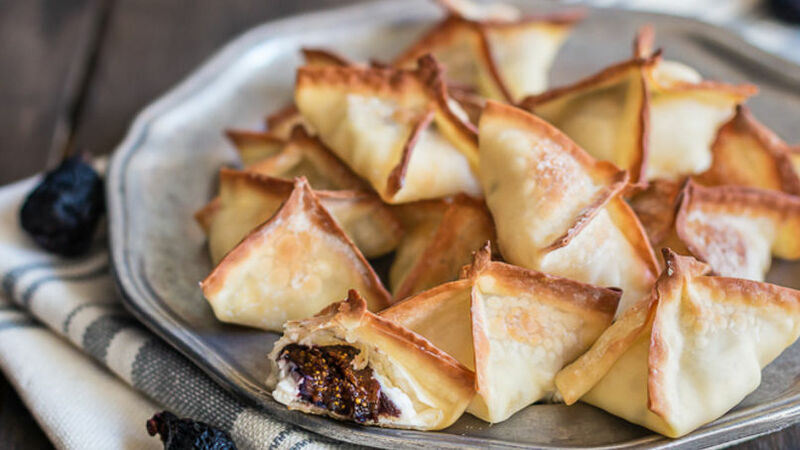 These easy and delicious appetizers are great for any occasion. The combination of cheese cream and figs creates a wonderful explosion of flavors. And because they’re baked, you don’t have to worry about eating 2, 3 or 4. Give them a try; I’m sure you’ll love them.